Materials. Learn how to pick the right materials for your project. This helps you avoid unnecessary material purchases and get through your next project faster with less waste. Stitches. A comprehensive list of stitches, including dozens needed for projects of all levels. If you prefer to embroider by hand this book is for you. You’ll also learn a lot of other techniques to master embroidery, from beginning and ending a thread to how to paint thread and using hoops. This is just the beginning of why so many people recommend Embroidery Stitches. Keep in mind that there’s also Embroidery Stitches 2 available, so if you like this one, you can always go a step further and get the second book in the series. Embroidery Stitches is easy to read, and this may be one of the book’s key selling points. It’s not a bland book that you have to drag your feet through. When you open the page, you’ll come to the basics that we mentioned earlier: fabric, beginning and ending thread, needles and transferring designs. Once you read these five quick pages, you’ll move right into the nitty gritty of stitches, and this will include 142 pages of great information. Almost all embroidery stitches are covered, and there are other techniques that you’ll learn throughout the sections to make sense of everything. It’s a great way to start learning the basics of stitches. Flipping to the split stitch, I am able to learn about when the stitch can be used. You’ll also find a lot of information about the history of the stitch, such as this stitch being used extensively in the Middle Ages. There’s a lot of great information, but it’s kept to a minimum so that we can jump right into the six steps of the stitch. I am a visual person myself, but having both the text and images guide me through the stitch is very helpful. The step-by-step guides are really the “meat” of the book. You’ll be able to follow along as you learn about each stitch and how to properly perform each one. What I and others have found is that the book goes over the initial foundation too quickly. You’ll find that a lot of the essentials are covered, but they’re not covered thoroughly enough for the true beginner. I recommend starting with another foundation book first. That isn’t to say that the meat of this book is bad – it’s actually superb for learning stitches. The diagrams are small, so keep this in mind. For most stitches, the smaller picture will suffice and not be much of an issue. But what about those stitches that are traditionally difficult to perform? The Algerian Eye Stitch, for example, requires precision, and with the smaller pictures, you’ll need to pay extra attention to the details to get it right. You can follow the diagrams, steps and pictures to success, so don’t let the small complaint above deter you. Beginners that have no foundation at all or don’t know how difficult one stitch may be over another will need to know that every small detail counts. 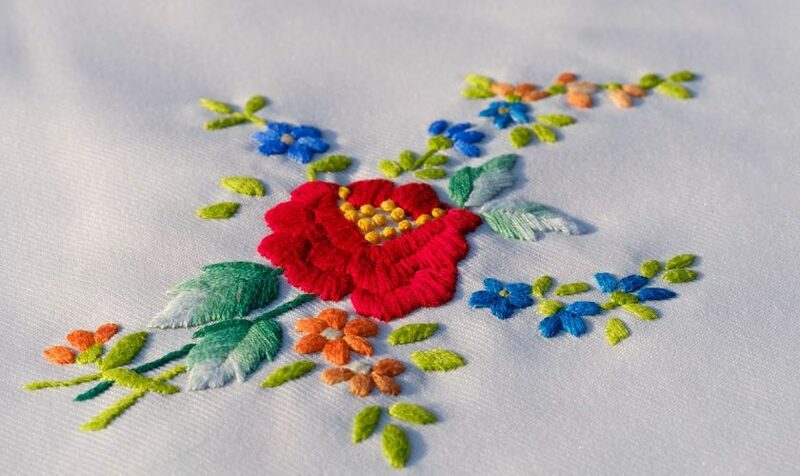 Those that have been embroidering for a long time will already know that certain stitches are more difficult, so they’ll pay close attention to the pictures. With that said, it’s still a great book that goes over all of the key stitches succinctly. I recommend every embroider have a copy of this book on their shelves as a reference guide for the many stitches available in embroidery. If you’ve ever wanted to try machine embroidery there are quite a few great and inexpensive options available to you. Visit this page to see a list of embroidery machines that we recommend. Go here to see other books we have in our quilting library.